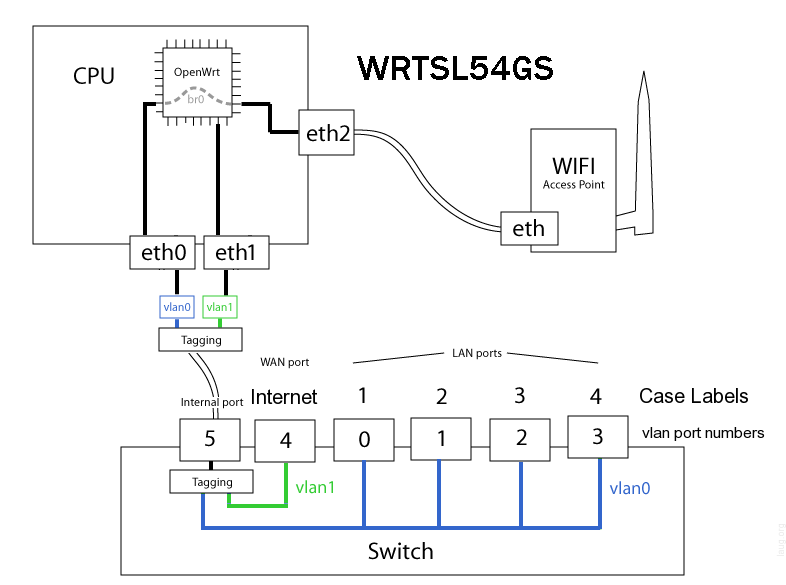 I now have my WRT54GL V24 RC6 serving separate public and private networks. My private network 192.168.1.0/24 has WPA and my public network 192.168.2.0/24 has an open ESSID for any to use, it's also on its own VLAN on port 4 of the switch. First go into Wireless on the web interface and set up the main wireless which will be your private one wl0. You can apply WPA to this in the usual way. Then set up your first virtual interface for public which will be wl0.1. You can add another alias which can be included on the same public network. Leave these as bridged for the moment, in RC6 you can change them from the web interface anyway. Now go into Setup/VLANs to put port 4 on VLAN2. This is not as straight forward as it appears since on my GL I had to select port 1 on the screen as this corresponds to port 4 in hardware. So in effect I had to move the tick on port 1 to VLAN2, leaving it set to none, to do port 4 on the back of the box. You will now need to reboot your router. The way this works is first to put port 4 on VLAN2 and create wl0.1 then to create a bridge br1 and add VLAN2 and WL0.1 to it. With the iptables rules this is then connected to the WAN. Clients on the 192.168.1.0 LAN and 192.168.2.0 LAN cannot ping across although they can both see the router on either 192.168.1.1 or 192.168.2.1. I have not implemented bandwidth shaping nor Hotspot splash page, but it's a start. The above is an excellent guide, but I wanted to set up two private networks, one for guest use, one for my private use. Everything appeared to be working until I enabled encryption on the virtual interface. Where <passwd> is your WPA PSK, and <SSID> is the SSID you want for the virtual WiFi interface. The issue is that nas is using the wrong bridge interface. It should be using br1. If the nas daemon for the virtual interface dies, it will be restarted with the incorrect bridge. I hope to ask the experts on the forum about this, but in case I don't get that far, the above does at least initially work.